This Sundayy (7/3) the Shadowbox on Kirk Ave. will be showing the comedy/horror film “Rubber”. Following the story of a telepathic killer tire named Robert this film has been hailed by critics all over the country. Come and see what this odd storyline is all about this Sunday at 8pm! Also this Friday the Bazaar on Brandon hosts the Situationist fresh off their tour! 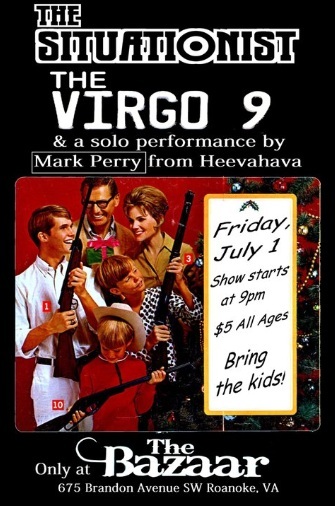 Playing with the Situationist will be Charlottesville band the Virgo 9 and Heevahava’s own Mark Perry doing a set of solo songs. This show is set to start at 9pm and will only cost $5. Check out our review of the Situationist’s newest E.P. under our Music Reviews page. 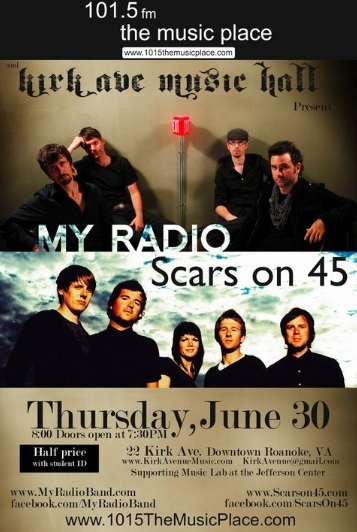 On Thursday (6/30) 101.5 the (not so local) Music Place hosts a night at Kirk Avenue Music Hall. Roanoke rockers My Radio share the evening with English modern rock outfit, Scars on 45. Doors open at 7:30pm with Scars on 45 opening at 8pm. Half price tickets are offered with student ID. Here’s a few other great things happening this week around town!!! 6/29 – Craft Night @ Freckles, Kirk Ave. Roanoke. 7pm. 6/30 – Mafia Track Suit w/ the Woody Nelsons & Lance Smith @ the Bazaar, Roanoke. 8pm, $5. 7/1 – Mandolin Orange @ Sun Music Hall, Floyd. 8pm. 7/1 & 2 – Message to You: A Mini-Musical for the Internet & Stage @ Studio Roanoke. 9pm (Fri) and 7pm (Sat). 7/1 – Bob Wayne “Outlaw Carnie” @ the Coffee Pot Roadhouse, Roanoke. 9pm. 7/2 & 3 – Floyd Fandango, Floyd. 7/3 – “Not All Roads Lead to Home: a Film by Noelle Lane @ the Taubman Museum of Art, Roanoke. 6pm. Have a fun and safe Fourth of July everyone!! !